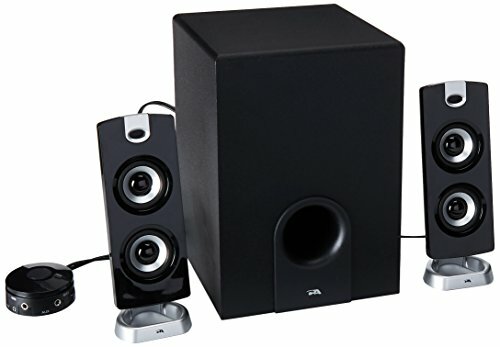 Our best selling 2.1 audio system with thunderous bass response, will ﬁll any room with amazing sound. This three-piece system includes two 2-inch satellite drivers and a 5.25-inch Power Pro subwoofer with a high-throw voice-coil and tuned port for an enhanced bass response. Sleek design of the satellite speakers will compliment any desk, PC, Mac, or multimedia entertainment system. Convenient system control of the speakers using the desktop command pod that also provides a 3.5 mm headphone out jack and auxiliary input jack. ! AC power 110V only. ! CA-3602a = Retail packaging.